THE SCENE: In the 1950s opera-trained baritone Jalacey Hawkins struggled to make his mark in the music biz, eventually realizing there was no market for Black opera-trained baritones. 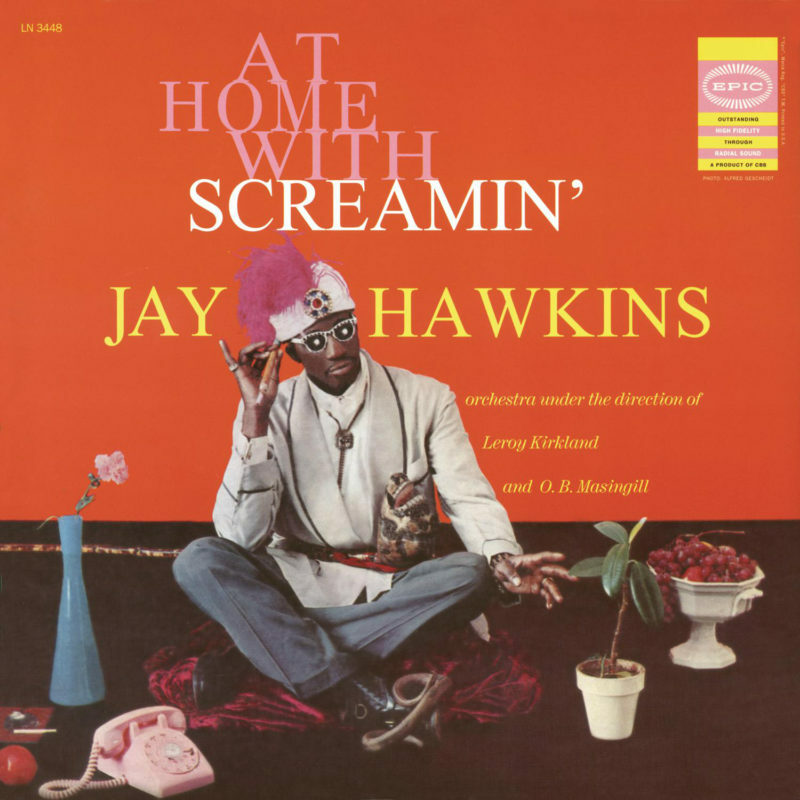 Realizing that his ability to scream in tune could apply to other genres he remade himself as Screamin’ Jay Hawkins, the blues-walloping, nose bone-wearing, skull-carrying wildman song terrorizer. After a series of singles he released his twisted debut album At Home With Screamin’ Jay Hawkins in 1958. The most well known track is “I Put A Spell On You”, a simple love song embellished with enough shouts, hollers, grunts, and demands as to possibly enact supernatural possession. Clearly unafraid of coming across foolish, Hawkins’ unfurls the world’s worst Chinese impression in the ridiculous “Hong Kong”, and equally silly German and French in the AM radio-smooth “I Love Paris”. Hawkins’ stage act played up his witch doctor affections, which helps explain the swampy bird calls of the moonshine-enhanced “Alligator Wine” and the hideous cuisine of “There’s Something Wrong with You” (Roast baboon salad smothered with bubble gum…/A dish of cow fingers and mosquito pie). THE FALLOUT: …it was banned from airwaves nationwide due to its cannibalistic nature. Yes, some radio people thought the song could actually cause the listener to eat human flesh. Whatevs. Although Hawkins developed a successful career as a touring musician At Home With… was a colossal failure. He recorded sporadically throughout the rest of his life, never coming close to another hit song but reaching a new audience through the 1984 film “Stranger Than Paradise”, heavily featuring a character haunted by, yes, “I Put A Spell On You”. Cannibalism be damned. Boldly silly yet swollen with talent, At Home With Screamin’ Jay Hawkins hollers at your front door, and it’s not leaving until you let it in. NEXT WEEK: Shock G, underground environmentalist. Hey Mark, I realized that you said you hadn’t heard Open; I have it digitally, if you know some way I could get it to you I’d be happy to. no new posts since march… I hope this isn’t the end. This is a fascinating blog. So many of my favorite albums show up here. There’s more to dig up and dig… What about Miles Davis ‘On the Corner’ or Digable Planets ‘Blowout Comb’ or Sly’s ‘There’s a Riot Goin’ On’… Don’t stop!